You will be charmed by this apartment of 75 m2, classified 4 *, located at the ground-garden of a house in traditional Ligurian style. It consists of two bedrooms (one with double bed and the second with two single beds) and a sitting room / dining room with a beautiful kitchen giving south side on the terrace and small garden. There, in a green setting, you can have lunch or rest in the shade of the bougainvillea and the olive tree. Decorated in white and gray, the interior plays sobriety and simplicity while offering comfort and a relaxing and refined lifestyle. A test! Property located in the district of Bréguières near the city center with two charming and character homes fully restored by us with environmentally friendly materials, lime and natural ocher paintings, in the spirit of simplicity of places and the original style. 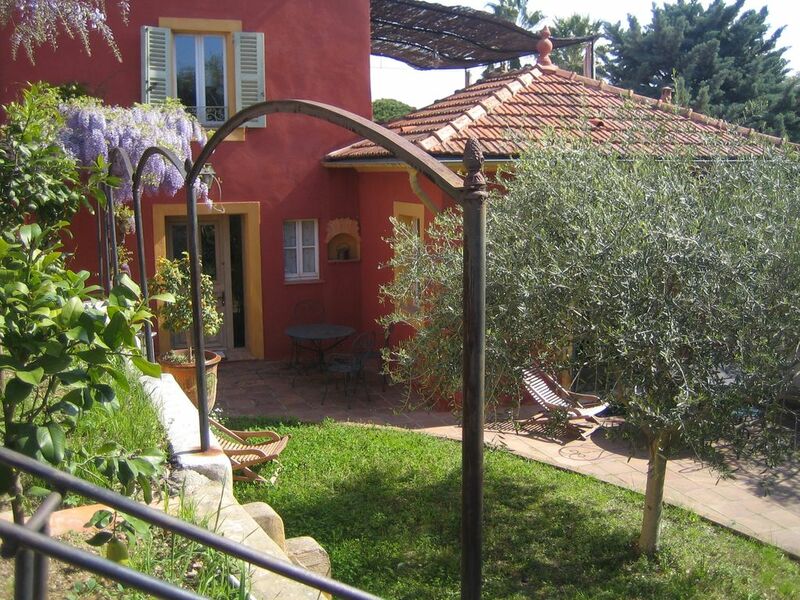 The apartment of 75m2, in ground garden of the red house can accommodate 4 people. It has two bedrooms, a living / dining room, a large kitchen. It opens onto a garden with lawn and a sheltered and flowered terrace. You will be seduced by the charm of this comfortable house very bright, the 'deco' personalized and sober. The Breguières district, very sought after because calm, very sunny and very close to amenities all within walking distance, is home to both individual houses and some residential buildings. Due to its strategic location, you are close to places of life and entertainment. The beaches of Cros de Cagnes are nearby (900m) and the city center of Cagnes-sur-Mer (about 500m) ... and Nice Cote d'Azur airport is less than 10 minutes by car. Whether for sea bathing or shopping, you can move without a car. Similarly, you can quickly access all amenities (shops, restaurants, various services, train station, bus stops ...) and walk to the famous sites of Cagnes, such as the racecourse, the old town, the area Renoir ... The privileged location of this area is very popular with holidaymakers. It is an ideal point of access and departure to discover the beauties of the Côte d'Azur. Our rates are all inclusive. On request, bed linen and towels are a flat rate of 9 € / person. We provide you with the maintenance and washing products for washing machine and dishwasher. Access to the wifi. NB. The accommodation is exclusively reserved for the tenants mentioned during the rental. Outside visits are not accepted. Any breach of this rule will be noted. We were met by Jeanne upon arrival and were immediately made to feel so incredibly welcome. Jeanne gave us an in depth tour of the stunning villa which far surpassed our expectations, it really is beautiful! She then showed us where to visit on a map and how to get to the market, beach etc. Everything is within a lovely 10-15 minute walk. It is perfectly placed for peace and quiet but within very easy walking distance of everything you could possibly want (10-15 minutes to the shops, restaurants, bars, museums, beach, bus station, markets and more). The bedrooms are beautifully simple, the beds very comfortable, the living area very homely and the garden is lovely to sit out in, with lots of outdoor eating space. Jeanne and her husband are the nicest couple you could wish to meet. They lent us electrical items, baked us some gorgeous croissants one day for breakfast and even invited myself and baby daughter to join them for a drink at a neighbours party one night that we were alone. I cannot fault this property at all!!! My only criticism of the whole trip is that I do not believe Cagnes sur mer is overly baby friendly as there is very little shade on the beach and we struggled to find any baby changing facilities or high chairs anywhere. I can very highly reccommend this villa though and am very grateful to Jeanne and Richard for their kindness and for allowing us to stay in their beautiful villa. Thank you!! !